odd socks | Have kids, they said. It'll be fun, they said. 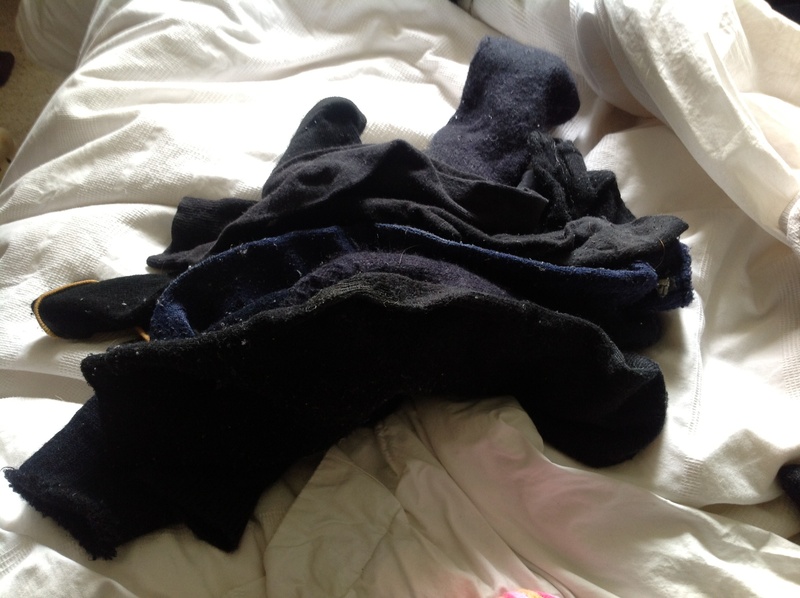 Today came the day I dread – the time when I can no longer ignore the ever-increasing pile of odd socks in my bedroom. Now, I don’t always store them in my bedroom. Sometimes they live in the laundry. Other times they live in the corner of the living room. It’s as though moving the pile is equal to sorting it. It’s not, by the way. How do odd socks even happen? I mean, I understand the theory. They are socks, so not huge items of clothing. So one would expect, oh, I don’t know – two or three to be odd and without a pair. But please. This many? I mean, honestly. 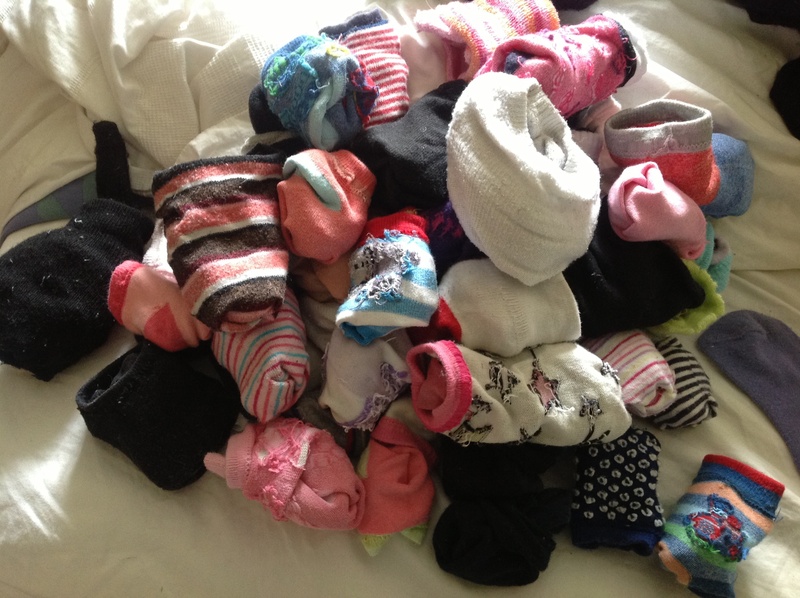 If I were a more-prone-to-paranoia person, I might suspect that someone is coming into my house and deliberately removing just-one-sock from each pair. That sure would be an awesome prank to play on someone. P.S. please don’t ever do that to me. Ironically, when Princess had an “odd sock” day last year at school, I couldn’t for the life of me find an odd pair. 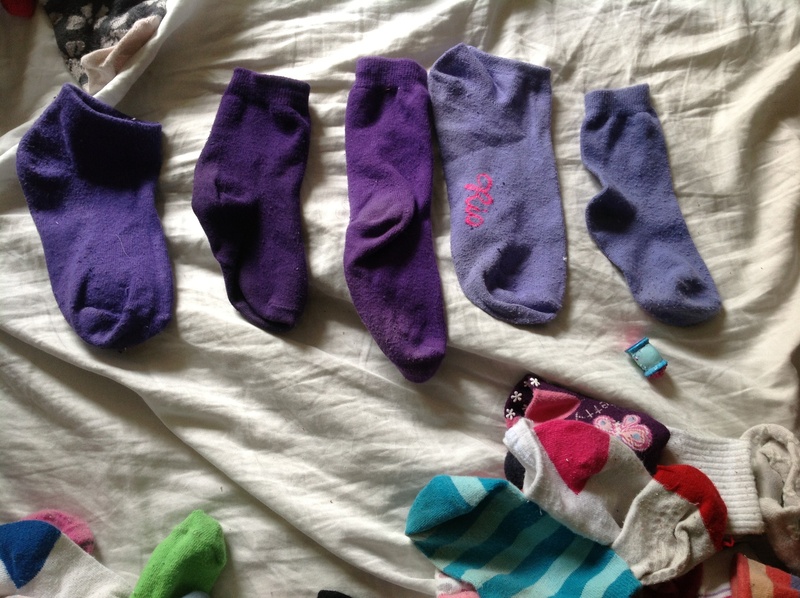 I’ve tried a few different approaches to minimising the odd sock debacle. I’ve deliberately purchased packs of identical socks. This certainly reduces the odd socks, though not by much. I’ve even gone out and purchased new socks for the kids, vowing that this time I will ensure that they are washed and dried together and will not, ever, end up in the odd sock pile. And then you have the packs of socks that come together. The “cousins”, if you will. They are similar enough though clearly not pairs. I fail to grasp how I can end up with three socks from the same family, every single one having lost it’s partner. How ….????? Or, the same coloured socks. Again, similar enough to trick the eye into thinking they are a pair, but different enough that it is blatantly obvious when in public that your socks don’t match. I give you, the purple ombre effect. None of these match. Mr T wears workboots to work and therefore has matching thick, woolen socks. I asked him once while sorting the socks, just how fussy he was when it came to pairing. “Doesn’t matter” he said. “Pair them however you like” he said. And then had to gall to grumble after work the next day about mis-matched socks. Granted I’d paired a blue woolen sock with a black ankle sock. My bad. Sorry ’bout that, husband. And so you have it, my odd sock pile of today. And, the lovely few who found their pair. Yay them, I say. I won’t lie – when I create a match, I applaud a little. 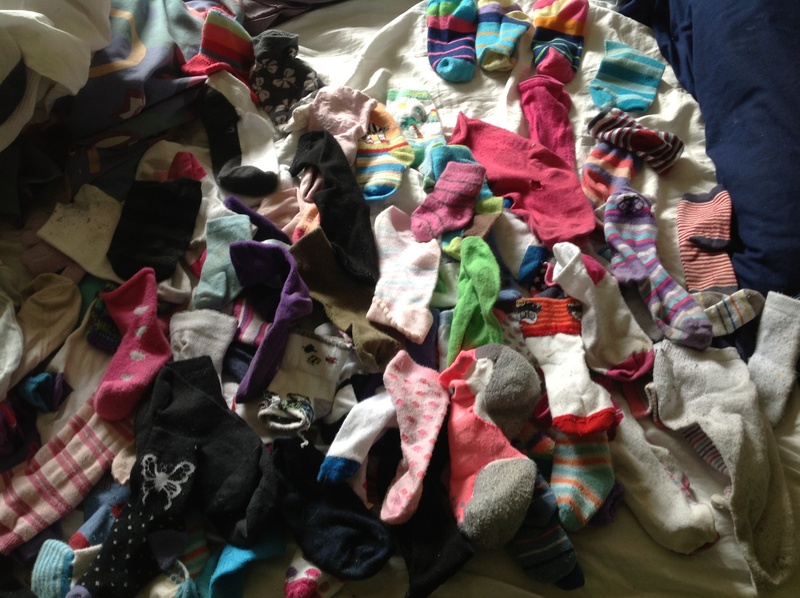 I have been known to talk to the socks while sorting as well. A bit like a Blind Date presenter. True story. Naw, look how lovely they look. Why don’t I just get rid of all these mismatched socks, I hear you ask? I’ve considered it, believe me. I liken it to hanging up the phone mid-phone call, I think – when you hang up, what if the very next thing said, fixed the conversation? 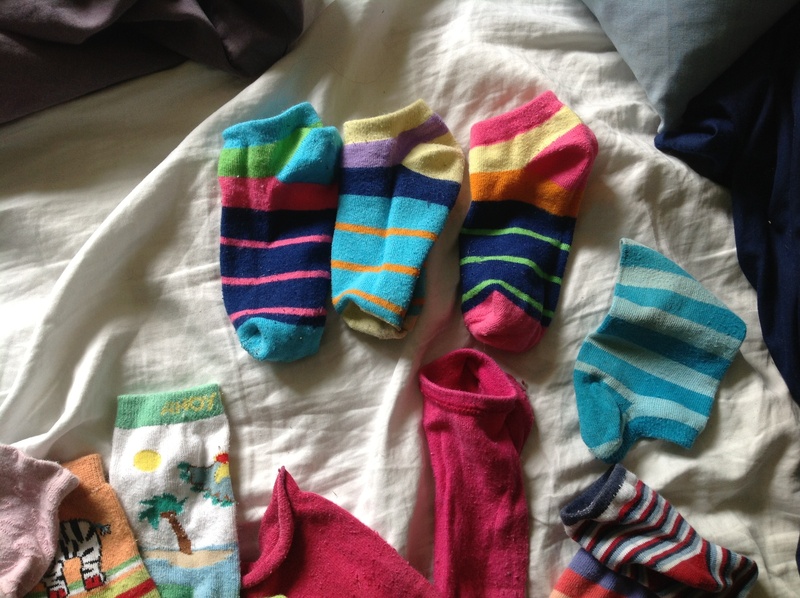 What if, in this case, the instant I throw out these socks, I discover their pairs, therefore re-starting the never ending cycle of odd socks?? And that is that. New pairs safely back in their respective drawers. And 103 odd socks, 3 odd mittens and 1 odd bootie, back in the box. Ready for another day. Far, far away.